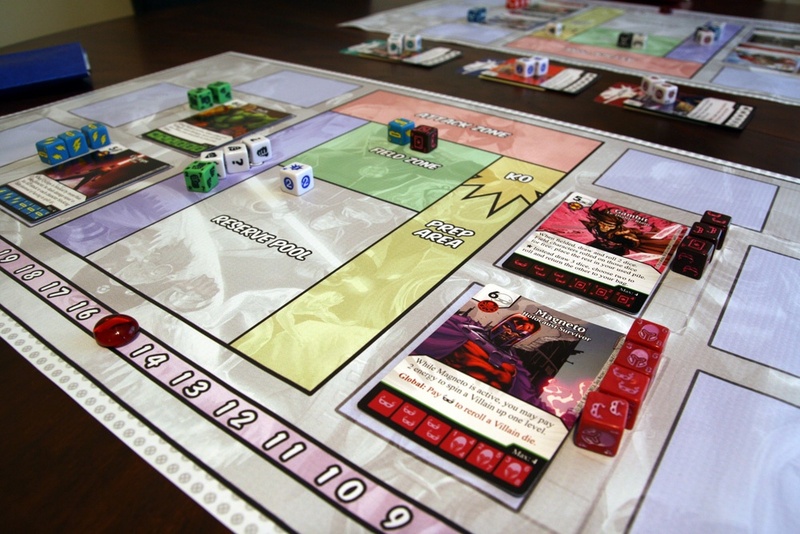 We review Marvel Dice Masters, the new dice building game from Wizkids Games. 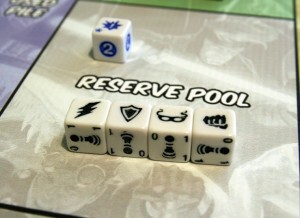 Marvel Dice Masters takes elements of Quarriors and spins them into a much better game set within the Marvel universe. Is this game worth dumping Quarriors for? Find out! 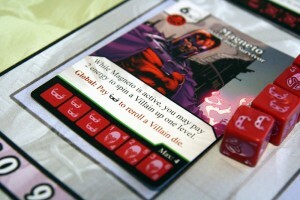 I could not be happier with Marvel Dice Masters (MDM) as the first game I review for Board Game Quest. I have been looking forward to playing this game ever since I became aware of its existence. A game that is a blend of Quarriors and Magic: the Gathering? Sign me up! I liked Quarriors, especially the dice building aspect of the game, but I was disappointed by the simplified combat system. As for Magic, I really like the game play, especially the battlefield tactics, but my usual gaming partner, my wife, does not like deck construction. So what do I think of Marvel Dice Masters now that I have had a chance to play several games? Read on to find out. Marvel Dice Masters is a collectible dice building/battling game for two players that plays in about 20 minutes. Each card allows a maximum of between two and five dice to be assigned to it. You and your opponent then alternate turns drawing and rolling dice, spending resources to buy more dice, or fielding heroes. 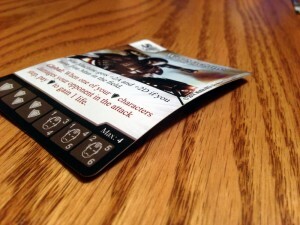 Then, similar to Magic: the Gathering, you will send your attackers out to try to damage your opponent. Your opponents can try and block your attackers if they have fielded characters at the ready, if not, they get damaged. The first player to reduce their opponent’s life to zero wins. 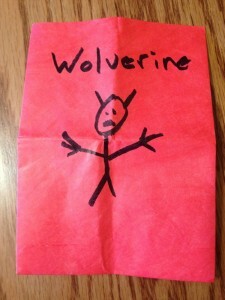 The dice bags that come with Marvel Dice Masters are somewhat of a joke. The starter set, retailing for around $15, is nice. It comes with 38 cards, which include three versions of the eight heroes included in the starter (Beast, Captain America, Hulk, Human Torch, Iron Man, Spider-Man, Storm, and Thor), as well as ten Basic Actions cards (two of which are chosen by each player, for a total of four used in each game) and four cards used as color reminders for the action card dice. The cards look great and have a nice layout, but be aware that, similar to Legendary, the card art for each character is recycled on all versions. The starter also includes 44 dice, with two copies for each character, 16 sidekick dice (think starting dice, similar to Quarriors) and 12 action dice. While the dice come in many different colors and each has a unique icon to identify which character the die represents, the quality of the dice left a lot to be desired. Many of my dice had faces that were missing color and/or had visible defects. All of these dice issues hurt only the appearance of the dice, and did not impact the functionality of the dice. Finally, the starter also includes two airsickness dice bags. I would recommend using anything BUT these as your dice bag, although I did customize my red dice bag (Pssst, I know it is my first review, and I should not be pandering directly to my readers, but if you are interested in purchasing this fine work of art, please let me know in the comments below). The booster packers each come with 2 cards and 2 matching dice. However, the packaging leaves a lot to be desired. The cards will somewhat flatten if you put some heavy books on them for a day. Booster packs, retailing for $1.00, come with two random cards and two dice that are associated with the two cards. Including both dice and cards together gave Wizkids a unique packaging challenge. How do you cost-effectively package the two together? WizKids’ answer appears to have been to crush the cards. To be honest, the condition of the unplayed cards looked similar to the Uno cards I used to play with my kids when they were five years old. While placing all of my cards underneath my Caverna box overnight improved their bent and bowed condition, it did not remedy all of the damage. In addition, the quality of these dice was no better than the dice included in the Starter Set. Overall, the component quality was disappointing. I understand that the game has a low price point, and that is why I chose not to utilize the adverb “overly” in describing my disappointment. If MDM boosters were priced similarly to Magic boosters, I would have been upset with the quality of the components. There are 4 different types of energy. Players will need a specific one of the 4 types to buy any of the characters. If you have played both Quarriors and Magic: the Gathering, you can skim through this section because you basically know how to play. Note that every character die is the same for that hero, so the dice used for Wolverine can be used for all three versions of Wolverine’s cards. You cannot use two cards with the same card name in your team, e.g. : two different versions of Wolverine. Each die is similar in that they have 3 sides of energy and 3 sides of characters. The die facings for every hero are as follows: one facing generates one energy of that character’s group, two facings generate two energy for that character’s group, and each of the three remaining facings represents that hero as a level 1, 2, or 3 character. 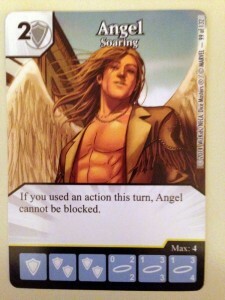 See the picture of Angel as a reference. You begin the game with eight basic dice that all have the same six die facings. These facings include one energy for each of the four character groups, one wildcard energy, and a sidekick (same as the assistants in Quarriors). Unlike Quarriors, these basic dice cannot be removed from your pool. • Clear and Draw Step – Any unused dice from the previous turn are moved to the used (think discard) pile, and four dice are drawn from the dice bag. If four dice cannot be drawn, draw all of the remaining dice, put all of the dice from the used pile in the dice bag, and then draw the number of dice that were short. • Roll and Reroll Step – Roll all four dice as well as any dice in the prep area (dice usually end up in the prep area when they are knocked out). Then use the one allowed reroll, choosing to reroll none, some, or all of the dice. • Field characters by paying any energy equal to the character’s fielding cost (top left corner of the die), and use actions during this step. 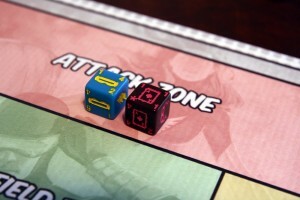 • Attack Step – Assign attackers, assign blockers, use action dice, and assign and resolve damage. Unblocked attackers damage the opponent. Combat is more similar to Magic: the Gathering than Quarriors because you can assign blockers, have multiple blockers block the same attacker, or choose to not block at all. If an attacker’s Attack value is equal to or greater than a blocker’s Defense value, and/or if the blocker’s Attack is equal to or greater than the attacker’s Defense, the character is KOed and moved to the respective prep area. Note that characters that attack or block but are not KOed simply return to the field for use in the next turn. • Clean Up – Any attackers that were unblocked are moved to the used pile. Marvel Dice Masters is highly customizable. Players can play with as few as 2 characters each or as many as 8! I first want to address the potential negatives of this game. MDM is a collectible game and boosters are a blind buy – The Starter Set is fixed, but it does not have enough content to experience a full 8 vs. 8 battle. As previously stated, boosters cost about $1. Cards come in four rarities – common, uncommon, rare, and super rare. Note that the dice have no rarity and that the boosters will not include any of the cards from the starter (there is one new card for each of the starter characters available in the boosters). For this review, I purchased a Starter Set and a Gravity Feed (a box of 60 boosters), as well as six individual boosters. After some trading with a friend, I still do not have at least four dice for 11 of the 38 characters in the game (I wanted to have four of each character because that is the most common max dice allowed on the cards), and I am missing five uncommon, 19 rare, and three super rare cards. Unless you spend a lot of money (defined subjectively by me as more than $100) and trade your duplicates, you will not get all of the dice and cards to have a 100% complete set. On the subject of component quality, I have already indicated my disappointment in the section above. But, due to the low price point and actual fun I have had playing the game, this is far from a deal breaker for me. Would I like better dice? Of course I would. But would I pay $4 a booster to ensure my dice and packaging are perfect? No, thank you. Finally, I am not a Marvel aficionado. I like the Marvel universe, but I do not pretend to know much beyond the most popular characters (who is Nova??). If the thought of super heroes and super villains on the same team or Punisher wielding Mjolnir causes you to involuntarily convulse, this game is not for you. For me, the game doesn’t have to be completely tied to Marvel canon to still be fun. When attacking or defending, each character has an attack power (number in the upper right) and a toughness (number in the bottom right). In addition, some charters may have a burst ability (denoted by the star on the lower left). So what did I like about the game? First of all, the dice rolling and decisions that need to be made are just plain fun. You start by rolling all of your dice and then trying to determine which dice, if any, you will reroll in the one reroll you are allowed. Should you leave the sidekick so you have a cheap defender, or do you reroll it hoping for more energy to purchase a more expensive die? If you roll a character but it is only level 1, do you want to reroll it hoping for level 2 or level 3, knowing that if you roll energy you are stuck with no characters to field? And if you do roll level 3, will you have enough energy to field that character? These examples are only for the reroll portion of your turn. There are more tactical decisions to be made during the Attack Step. As an attacker, should you assign a character to attack, knowing that your opponent has a blocker that will KO your attacker? Maybe that is not a big deal because it was only level 1 anyway, and will be rerolled with your four drawn dice at the start of your next turn. Or do you hold back on attacking to make sure you can have enough blockers during your opponent’s turn? As a defender, you may intentionally let an attack through so that the character is moved to the used pile instead of the KO. Alternately, you may use multiple defenders to eliminate a significant attacking threat and hope that your opponent rolls that die as energy on their next turn. Second, I like the variability and flexibility of the game. Building your team and balancing which characters to include are just plain fun. Not only does each character have three variations to choose from (four if they are in the starter), but the two action cards that you choose can be synergized with the team that you bring to the game. Do you want to field a fast team with every character costing only two or three energy? Go for it. Do you want to use a team consisting of only Tough and Melee characters? Do it! Do you want to field a team of Super People whose names begin with a consonant? You sure can! But if you do not like deck construction, don’t worry. Constructing your team can be as simple as grabbing eight characters and just playing. Heck, my wife even likes constructing her own teams! Some characters have global abilities that can be activated by either player. The game also incorporates Global Effects, which are powers that are included on some action and character cards. If a card with Global Effects is in play, either player can utilize them by paying the energy cost needed to use the power. You cannot ambush your opponent with these powers, unlike interrupts in Magic, because they are clearly visible on the table, but it does add another option for energy usage to the game. Finally, the game is simple to teach and plays fast. Whether you have played Quarriors or Magic, or if you are completely new to MDM’s game mechanics, it is easy to pick up after a couple of rounds. There are the usual timing questions that creep up in these types of games, but we only came across a couple of them, agreed upon a ruling, and continued playing. And this game definitely plays fast. Our longest game was about 25 minutes. Our shortest, when I had a particularly bad string of luck, was over in 7 minutes. To be honest, the bad luck did not even bother me because it was over so fast and we were able to start a new game. I really like Marvel Dice Masters. I have played it with several different opponents, from my wife, to friends, to my 10-year-old daughter. All of them understood the game after a couple of turns and all of them wanted to play the game again as soon as we were done. They wanted to try out different characters or use a different version of the same character. Most importantly, they had fun, which is what gaming is all about. 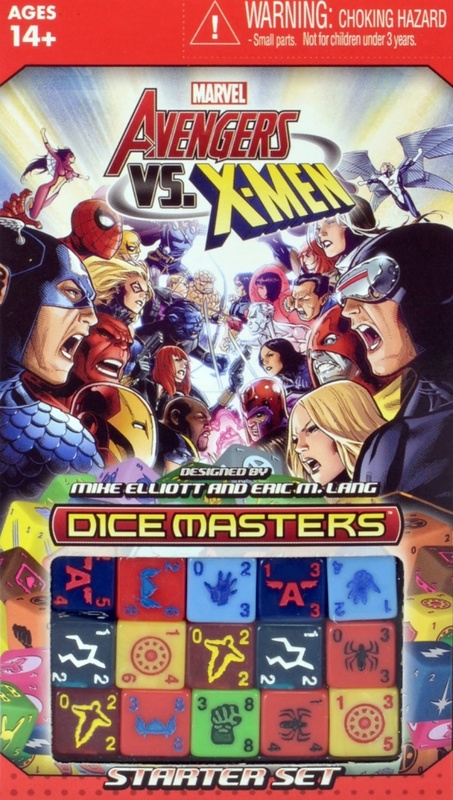 I highly recommend Marvel Dice Masters and cannot wait for the upcoming Uncanny X-men expansion that will only increase the variability and number of choices that will be available in both building your team and the game play itself. The game does lose some points due to its component issues and I am curious as to how this forthcoming expansion affects the game. 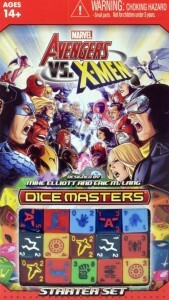 Right now, Marvel Dice Masters is somewhat hard to find, but a reprint is due in stock in the next couple of weeks. If you can find a copy, pick up Marvel Dice Masters today. Play Mat: If you are interested in the play mat seen in the photos, you can buy one here. 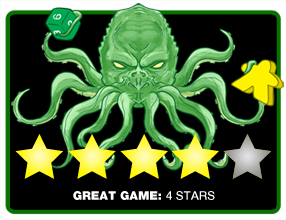 Final Score: 4 Stars – An excellent dice building/battling game that is easy to learn, fun to play and presents many interesting decisions during game play. It was printed at the same place, just some of the artwork on ours we customized a little. They will print you a custom one if you are in need. Yup. I’m pretty sure you can buy any of the Marvel Dice Masters booster packs and use them interchangeably.